This wholly original reassessment of critical issues in modern Chinese history traces social, economic, and ecological change in inland North China during the late Qing dynasty and the Republic. Using many new sources, Kenneth Pomeranz argues that the development of certain regions entailed the systematic underdevelopment of other regions. He maps changes in local finance, farming, transportation, taxation, and popular protest, and analyzes the consequences for different classes, sub-regions, and genders. Pomeranz attributes these diverse developments to several causes: the growing but incomplete integration of North China into the world economy, the state's abandonment of many hinterland areas and traditional functions, and the effect of local social structures on these processes. 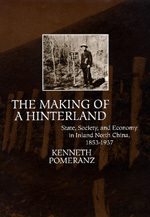 He shows that hinterlands were made, not merely found, and were powerfully shaped by the strategies of local groups as well as outside forces. Kenneth Pomeranz is Associate Professor of History at the University of California, Irvine.